Despite the unbearable heat, summer in Japan is the season for a lot of good stuff–including food. One thing I had wanted to do for sometime was to go to a small coastal city during the uni or sea urchin season and indulge myself. So, before going to Ichinoseki, I took a wide detour and rode a local train from Sendai to Kesennuma in Miyagi, at the border of Iwate, via Oya-kaigan. 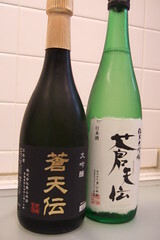 Besides, there was a sake brewery in Kesennuma I’d had my eye on for a while too. Why Oya-kaigan? It’s a dinky little JR station, 2 hours away from Sendai and it’s right by the beach. I arrived with a few local old ladies on board. They weren’t surprised that there’s no station master, but for a Tokyoite, an unstaffed train station, or even an automated ticket machine, was quite change. When I was searching for a good spot for uni on the internet, I saw they have an Uni Festival in July where they serve uni-don and sells whole uni shells. When I called their tourist promotion section at the city office, they said there’s no guarantee I would find uni there at this time of the year, early July, because it is still early in the season. I said fine and took the chance on stopping at this little sleepy beach town famous for uni and seafood. I managed to have uni-don at the restaurant right at the station overlooking the beach at 11:00 a.m. “Locally caught uni!”, the lady said. I checked because I was on guard when she said uni-don was on the menu year around. 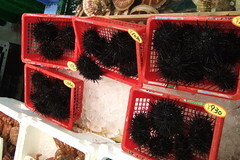 I did not want to travel all the way to have Chilean sea urchin that I could buy in Tokyo. 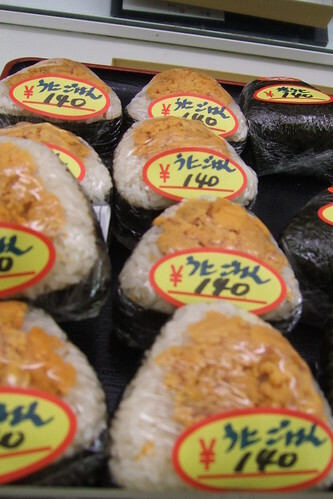 It was great, but I got really excited to find uni onigiri, uni bento, awabi onigiri, and awabi bento for anywhere 140 yen 350 yen in the small store next door to the station where they sell locally caught fish and local vegetables. The uni onigiri I got was a bit mushy, but smelled just like ocean and was good. Then, I hopped back on the next train that runs like once an hour or two to Kesennuma, a big working port famous for sharks’ fin and other seafood. The big open market next to the wholesale seafood market was filled with fish and uni in season. Spiny dark purplish creatures were everywhere among whole katsuo, tuna, or piles of sharks’ hearts they called mouka-no-hoshi. All around the market, the sign said sharks’ hearts are sashimi grade, which I believe is one of their local specialties, but even for a generally curious mind, it did not sound too appealing. (If you dare to see some pictures of mouka-no-hoshi, please let me know.) 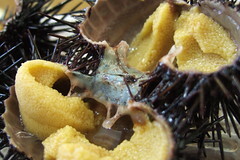 I got two shells of uni to eat there. In the market, I spotted a shop with local sake, and was grabbed by the idea of having the urchin fresh out of the shell with nihonshu. I debated, and debated, and debated if I should wash down this salty and buttery yellowish lump of eggs that tasted like ocean with sake. In the end, I did not because I did not want to be smelling of alcohol on my visit Otokoyama Honten brewery, just 10 minutes walk from the market. The old part of Kesennuma by the port was rebuilt around 1920 after a big fire and you still see some buildings from that era. 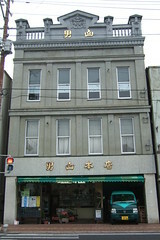 Otokoyama Honten, the brewer of Fushimi Otokoyama and Soutenden, is one of those buildings with a classic storefront built in the beginning of the Showa Era. Sugawara-san took me around the brewery, which is 5 minutes away from the store. This was built around the turn of the century with three independent kura covered under one big roof for insulation. Being by the bay, their sake is a natural fit for seafood. Soutenden is really elegant, it does not have too much upfront aroma and settles in really well. As I was tasting Soutenden daiginjo, I was thinking about that uni from the market. I should have gone back to the market and had more uni with Soutenden! Oh, well, next time. 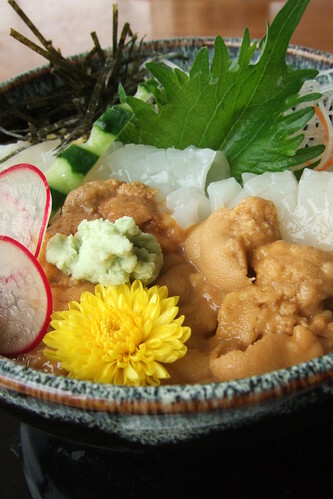 After this trip, I was ready to check off “uni” from my list, before I saw this blog from Kesennuma with uni-don pictures. Now, really, I have to go back to Kesennuma. Hi Mike, I must have sent you email by mistake! Anyway, I will dig in my file for pictures of hearts. You are quite adventurous!